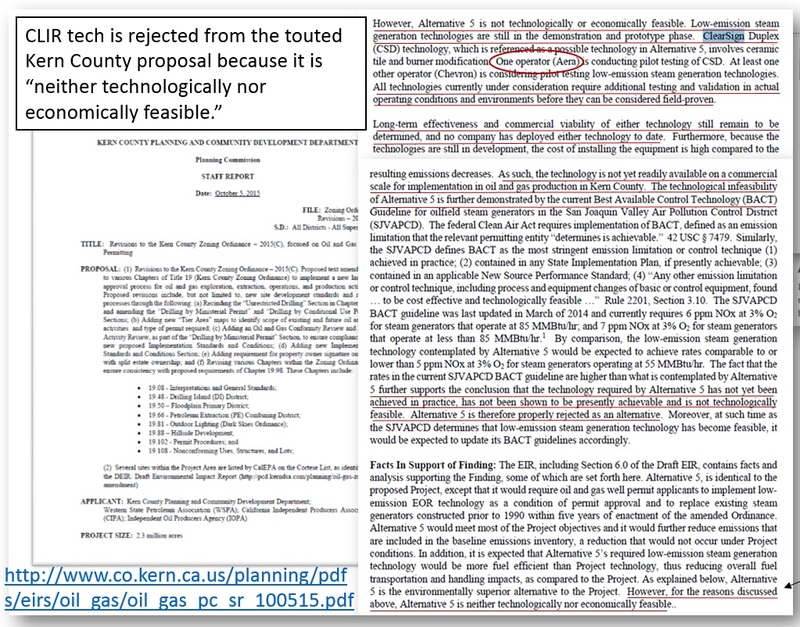 Transparent Citation Kiting in the 2013 and 2014 EAS “consensus” of experts: how to carry a conclusion without having to reach it. Pharma-funded publications are using readers’ suspended attention between publications to leave out facts, definitions, and even key numbers. I’ve referred to this removal during the researchers’ transfer of information as a “fact-ectomy.” As for “citation kiting,” like check kiting, it claims a value on paper which persists as a value only as long as that claim remains unreconciled with its source. The scheme is easy to see, once we’re looking for it. We just trace the “citation” back to its source, match up quantities claimed in each, account for “innovative” definitions, and then set up their respective values and terms side by side. With citation kiting, what we see is something like a relay team that cheats by switching batons, instead of passing on the original. In SEC 10-K filings this 2014 EAS report is the source for the HoFH prevalence of 1/300,000. (It also takes the 2013 EAS HeFH number and through derivation cites 1/160,000 for HoFH.) It’s not epidemiology. It’s a gimmick. The prevalence of HoFH was actually confirmed with the very same data presented as refutation. Which Wall Street companies are interested in FH Prevalence? 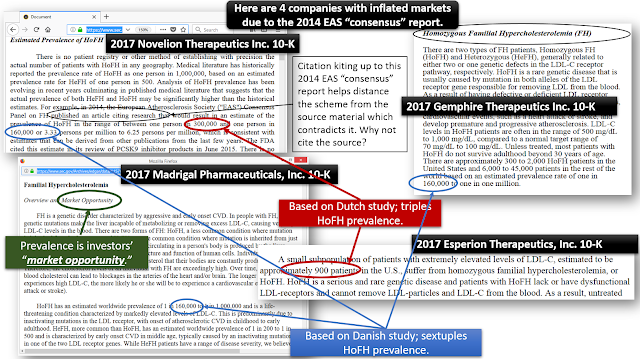 Big players like Amgen, Regeneron, Sanofi, Merck, and others are financially interested in FH prevalence. However, Novelion (NVLN), Gemphire (GEMP), Madrigal (MDGL) and Esperion (ESPR) are also valued according to how large or small the FH population might be. These four companies go the extra mile and actually claim prevalence estimates in their annual reports filed with the SEC. Below are screenshots I took last year of the 2017 10-K’s. The same claims are made in the 2018 10-Ks. All four claims depend upon “consensus" reports, which actually conducted no prevalence studies of their own. After chasing the literary references down to their sources, the stones upon which these prevalence claims are built are not scientific. They are linguistic and depend upon preserving asymmetry between what the authors and their readers know. The 2014 EAS HoFH prevelance estimates – 1 in 300,000 and 1 in 160,000 – are derived from citation kiting. 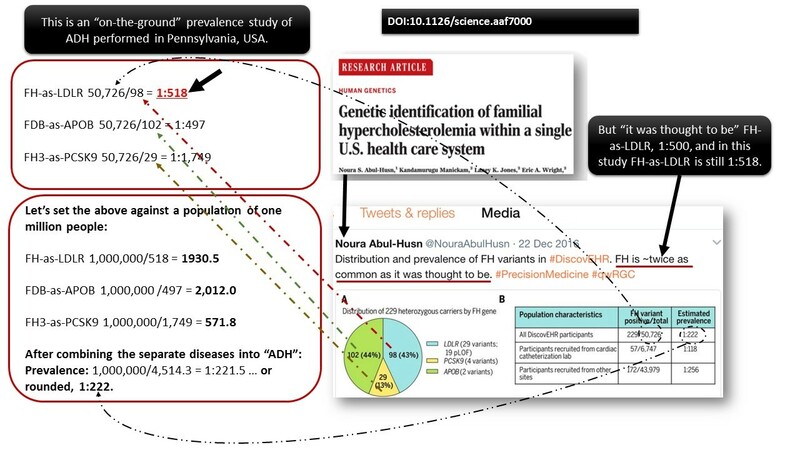 This results in the the equivocation of the (1) genetic definition of the disease and (2) diagnosed FH. 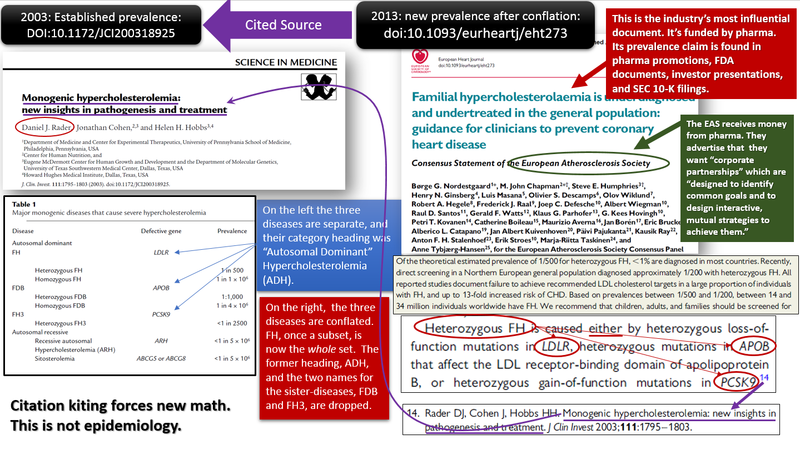 Of these two, we will first look into the former, the linguistic equivocation of the genetic defintion of FH. 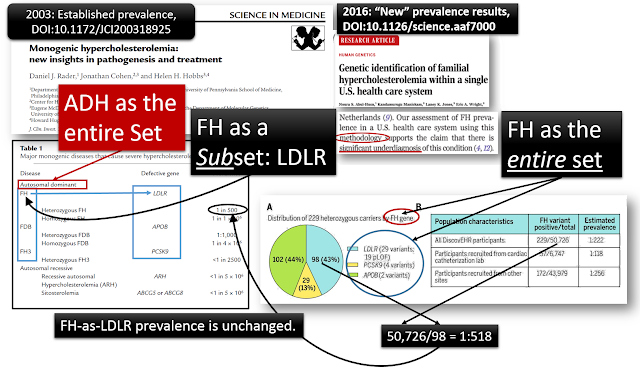 In a separate presentation, I will provide evidence of the equivocation of “FH” through the removal of key elements/steps in the diagnostic procedure. Here is what an increased prevalence means ... and doesn't mean. 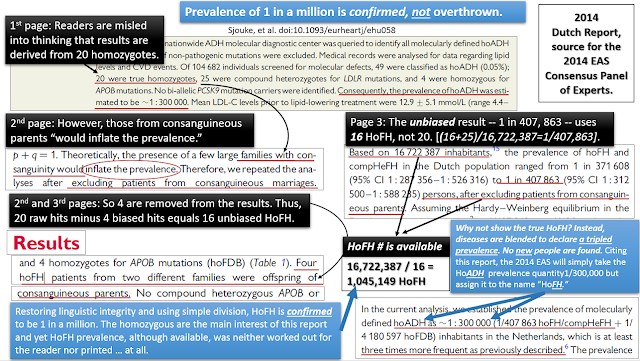 For prevalence of homozygous FH, the difference between the Danish result of 1/160,000 and the Dutch result of 1/300,000 is large, but we must also remember that the original estimate by the Nobel Prize winner was 1/1,000,000. Even if we just consider Novelion, and not the entire industry, we can see what is at stake. 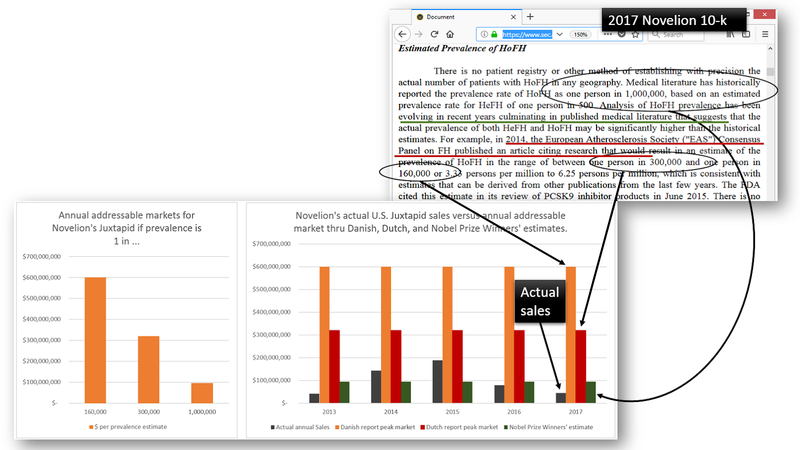 What will shares of Novelion be worth with this or that prevalence figure? When raising money from investors, what value will investors place on such a company after the Dutch report? The annual price of Aegerion/Novelion’s drug, Juxtapid, has ranged from $290,000 to well over $300,000 during the last 5 years. To create a rough sketch, I used $300,000 to represent the price over these years and 320 million for the U.S. population. Then I calculated the annual addressable market per prevalence estimate according to the Danish and Dutch reports. I set these two estimates between Aegerion/Novelion’s actual Juxtapid U.S. sales during the last 5 years and an addressable market in accordance with the Nobel Prize winners’ estimate. 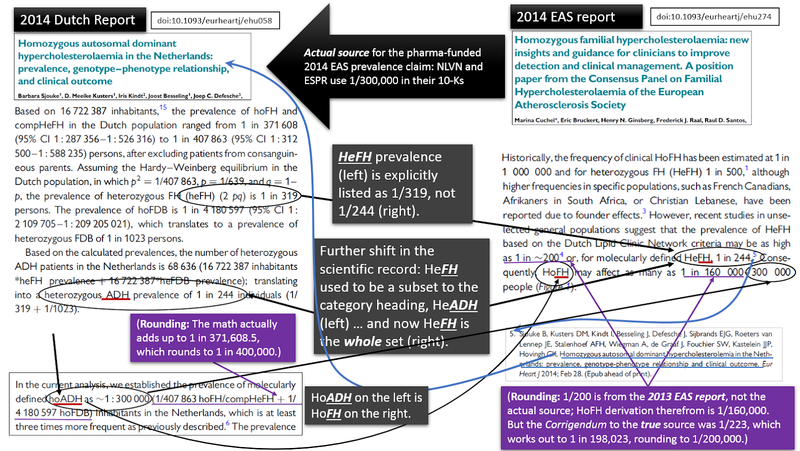 Intro: Citation Kiting in Peer Reviewed FH Literature. The explainer video above illustrates the consequences of citation kiting -- as if they were "Before" and "After" photos. The 2003 "Rader report" and the 2016 "Regeneron report" expose the linguistic and mathematical "conclusion drift" that took place in the interim. But how was this equivocation scheme executed? In a future presentation, I will display screenshots of specific acts of citation kiting and the resulting equivocation. Below is a text version of the above, with a little more detail. Background: The disease “Familial Hypercholesterolemia” is caused by a mutation in a cholesterol receptor (LDLR). To express this relationship in acronyms, FH is caused by LDLR. Recently, peer reviewed medical journals have published papers declaring that FH prevalence is twice what it was once thought to be. Of course, funding by pharmaceutical companies surrounds these peer reviewed publications, payments to both the authors and the journals. · MDGL Madrigal Pharmaceuticals Inc.
· GEMP Gemphire Therapeutics Inc.
· ESPR Esperion Therapeutics Inc.
· Companies which market statins also have an interest. I will break down my presentation into two parts. In part 1, I will make the case that the “increased” prevalence number is the result of a linguistic gimmick. As a consequence, the integrity of the scientific record is compromised and the addressable market for FH-targeted drugs is inflated. How far does this scheme go? In any event, I cannot say that exposing peer reviewed medical literature would be the next “Big Short” – because that institution seems to be untouchable. However, what I will outline is a transparent equivocation scheme, carried out by what I call, “Citation Kiting” – with very serious consequences. Citation kiting has two consequences, one of them seemingly trivial (although it is not), and the other obviously serious. Part 2: “FH” as diagnostic procedure: A fact-ectomy is performed on elements and/or steps within the already established diagnostic procedures and screening strategies. Blending the underlying objects under one name. Tracking the underlying objects of the original names. Past “ADH” ≠ past “FH”. The change is only due to linguistics. 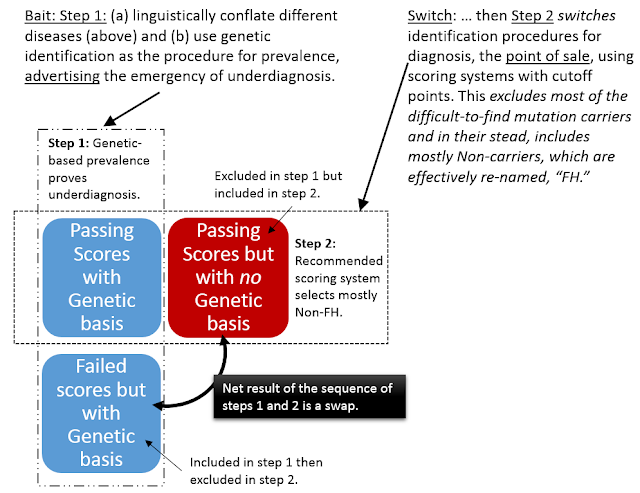 After conflation of the names of genetic mutations, add a second step -- switch counting procedures to identify different patients. There is a lot more to this case, and some of it requires an elaborate breakdown and detailed presentation. Other parts are knee-slapping comedy. There is also tragedy. I hope to present the whole of it, step-by-step, where each unit of the presentation will be undeniably clear. Toward this end, I am trying to put together short explainer videos, walking through not only the evidence, but exposing the actual engineering of equivocation … at the point of commission. I will also be posting detailed PDF reports online. Please visit 3footcrowbar.com for announcements. How can one increase a prevalence rate without having to find more people? Here is only one example. The illustration below shows the consequences of citation kiting -- as if they were "Before" and "After" photos. The 2003 "Rader report" and the 2016 "Regeneron report" expose the linguistic and mathematical "conclusion drift" that took place in the interim. But how was this equivocation scheme executed? In a future presentation, I will display screenshots of specific acts of citation kiting and the resulting equivocation. Here, I’ve taken screenshots from two FH reports and put them together in the presentation below. On the left is a report from 2003, and on the right, Regeneron’s report from 2016. In 2003, FH referred to the presence of an LDLR mutation; FDB was different and referred to an APOB mutation, and FH3 was yet another disease name, and referred to PCSK9. These diseases were all under the umbrella acronym, “ADH” – which spells out to “Autosomal Dominant Hypercholesterolemia.” Now Big Pharma has funded reports which drop the umbrella, “ADH,” and take the subset of ADH named “FH” and promote it to serve as the umbrella term for the other two diseases. FH is no longer alongside FDB and FH3, and the terms to distinguish FDB and FH3 are dropped, and their respective mutations, APOB and PCSK9, are no longer referred to as subsets to “ADH,” but to “FH.” It is as if the peas under the shells labeled “FDB” and “FH3” have been palmed and are next found under the FH “shell,” which now houses all … the LDLR, the APOB and the PCSK9. FH becomes the main set … the entire set. · A whole pie is larger than one of its slices. · Recent “FH” as LDLR + APOB + PCSK9 is greater than Nobel Prize winners’ “FH” as LDLR alone. Bottom right, of the illustration below is a tweet by the lead author of the Regeneron report. But FH "was thought to be" FH-as-LDLR, which was estimated to be around 1:500 to begin with, and in this study FH-as-LDLR is still around 1:500. I'll be posting a new report soon. If interested, join the mailing list (on the right). I plan to post there first, then here. · Through direct communication and omission of material fact, Aegerion led investors to believe that the 2013 patient dropout rate was a stable 15%. · Aegerion finally updated investors in late 2014, claiming a “blended” dropout rate of 36%. The stock price dropped 40% on the next day of trading. · To reach that 36%, Aegerion distorted the rate downward when it “blended” the patients acquired in 2013 with new patients acquired in 2014. · If 2013 patient dropout rates are reliable and if such also applies to future first year experiences, simple high school math shows that Aegerion’s relevant dropout rates are much worse than we have been led to believe, most likely between 50% and 60%.Aegerion’s disclosures explicitly admit that the dropout rate is material information, that they withheld this information, and that they are continuing to withhold this information.If we accept Aegerion’s claims that the majority of dropouts occur within the first two months of therapy, then we must abandon our dropout estimate for first year patients in 2014 and we must accept that Aegerion’s commercial enterprise is presently in the midst of an undisclosed marketing crisis. All other data points have been provided by Aegerion or are mathematically derived therefrom. Suppose an athlete ran the mile yesterday in 6 minutes. Today he stopped halfway at 3 minutes. Could I really convince anyone that his “blended” time of 4.5 minutes makes him a world class runner? Why wouldn’t I isolate yesterday’s distance and time from today’s half-distance unless I wished to mislead someone? If I wanted to include times for both days I must divide the data into three distinct time periods. · 1st half of race: 3 minutes. · 12 months: Patients acquired in 2013 tracked through 2013. The dropout rate for the first year was said to be 15%. · 9 months: Patients acquired in 2013 tracked through the first nine months of 2014. But even without using specific numbers we know that something is not right. · Because dropouts occur over time, blending new patient additions with old patient additions necessarily distorts the dropout average downward and misleads investors into thinking that the problem is less than it really is. Retailers, for example, use same store sales to isolate the mature portion of their business from the immature. Blending this year’s newly opened stores with last year’s established stores would necessarily distort the sales metric downwards. Aegerion’s Investors must resort to puzzle-solving in order to fill in the missing pieces. In the puzzle below, I will start with one set of inputs, as an illustration, but I encourage the reader to estimate a range of inputs and plug them into the equations. One will soon observe that even a wide range of estimates suggest that Aegerion may have misled investors. · There were 430 patients in the USA by the end of 2013. · Quarterly net cost of the drug at the end of September 2014: $78,277 per US patient. 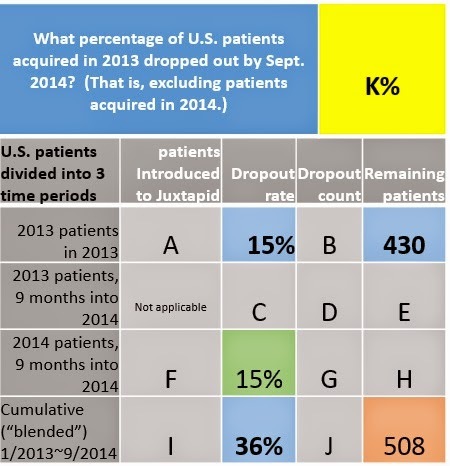 To say that 430 patients remain after a 15% dropout would be consistent with saying that the 430 remaining patients were 85% of the total patients introduced in 2013. A x .85 = 430 is the same as 430/.85 = A. A = 506. Of 506 patients introduced, 15% dropped out: 76. · 506 x .15 = 76. · 506 – 76 = 430. Step 2 follows the same procedure as step 1. If 508 patients remain after a reduction of 36%, then we would say that 508 was 64% or the original total. I x .64 = 508 is consistent with 508/.64 = I. I = 794. 36% of 794 means that we estimate 286 total dropouts over both 2013 and 2014. If we have a total of 794 introduced to the drug over the entire time period and 506 of them were introduced in 2013, then how many were introduced in 2014? 288. · 794-506= 288 new patients introduced in 2014. Aegerion claimed a stable 15% dropout among first year patients in 2013.2 If this is reliable then in turn we use a 15% dropout rate for the first year patients in 2014. (See Endnote 3 for detailed considerations.3) If we’ve estimated that 288 patients were acquired in 2014, we then calculate that 43 dropped out and 245 remained. If there were a total of 508 remaining patients at the end of September 2014, and 245 of them were from the 2014 cohort, then how many from the 2013 cohort remained in 2014? · 508 -245 = 263. Without “blending” in new patients acquired in 2014, how many of the patients who tried the drug beginning in 2013 dropped out in 2014? We have a cumulative 286 dropouts by the end of the third quarter 2014. We estimated that 43 of the patients acquired in 2014 dropped out in 2014, and 76 of the patients acquired in 2013 dropped out in 2013, which means that 167 of the patients acquired in 2013 dropped out in 2014. So what percentage of the patients who remained on the drug at the end of 2013 dropped out by September 2014? Of the 430 patients remaining on the drug by 2013, 167 dropped out in 2014. That is a 39% dropout rate for the second year of use and in addition to the 15% reported dropout for the first year. If we isolated the patients acquired in 2013 and did not “blend” in new patients from 2014, how many of the patients acquired in 2013 dropped out by September 2014? We estimated that 76 dropped out in 2013 and 167 in 2014. That’s 48% of the 506 introduced in 2013. · It is easy to understand why Aegerion presented the cumulative rate of 36% rather than rates from each isolated cohort. A responsible tally demonstrates that Aegerion’s 2013 cohort dropout rate has accelerated to 50%. Although the laws of mathematics are immutable, the results are only as focused as the estimates we plug into them. Nonetheless, in Aegerion’s case the room for error is very wide. There is some suspicion in regards to patient counts. For example, Aegerion claimed to have 430 US patients on the drug at the end of 2013. However, deriving a patient count from revenue leaves us with an estimate of 304. The difference, however, matters little. Either number – 430 or 304 -- shows a severe loss of patients over time. If we accept 430 as the number of patients at the end of 2013, then the drop-out rate for these patients over the 21 months to September 2014 would be approximately 50%; if we estimate there were approximately 304, then the drop-out rate would be approximately 60%. I encourage the reader to take Aegerion’s disclosures and attempt any responsible input. If we accept that Aegerion’s disclosures in 2013 about patient dropouts were true and that they serve as a reliable measure of future first year patients, then the dropout for patients acquired in 2013 must have accelerated through 2014. If I say that the first slice of a pie is larger than the second slice, that second slice cannot be more than half of the pie. A responsible set of inputs shows that Aegerion’s dropouts in the second year exceed the first by more than 200%. Returning to the 2013 cohort highlighted in this report, we estimate that 167 dropped in 2014, only 76 dropped out in 2013. Again, it is mathematically impossible for the first slice of the 2013 cohort to be larger than the second slice when that second slice is more than half of the pie. 76 dropouts / 12 months in 2013 = 6 per month. If I have a tendency of 6 per month in 2013, how can I then say that it is more than the tendency of 19 per month in 2014? To make Aegerion’s claim possible, at a minimum, the dropout rate for the 2013 cohort in 2014 would have to be less than it was in 2013, not more. We shall see what can happen if we do not accept the 15% dropout rate for the 2014 cohort. If we take Aegerion’s claim that the majority of dropouts occur in the first two months, then we would have to lower our estimated dropout rate for the 2013 cohort’s experience in 2014. As we saw in the previous section of this report, it would have to be lower than the first year’s rate of 15%. First, if we lower the dropout rate for the 2013 cohort in its second year to 10%, then in order to be consistent with the cumulative 36% rate, we must significantly raise the rate for the 2014 cohort -- to nearly 60%. Second, such an admission would mean that Aegerion’s current growth story is false: it would actually be a marketing catastrophe in the making. Third, such an extreme and recent dropout acceleration would require specific disclosures of both the sudden acceleration of the dropout rate itself and the factors accounting for the extreme difference between this year’s experience and last year’s. I have found no such disclosure. 1. Aegerion’s use of a 36% “cumulative” rate distorts dropout rates downwards. Dropouts are much worse than Aegerion has made them appear. Relevant dropouts are probably closer to 50% or 60%. 2. Aegerion’s failure to disclose the relevant dropout rate constitutes an omission of material fact. 3. If we accept Aegerion’s claims that the majority of dropouts occur within the first two months of therapy, then we must abandon our dropout estimate for first year patients in 2014 and we must accept that Aegerion’s commercial enterprise is presently in the midst of an undisclosed marketing crisis. What is the purpose of disclosing patient metrics if not to aid the investor in evaluating the business? Of two metrics available why provide the one which decreases awareness of risk unless one’s aim is to mislead investors? In this last reporting period, Aegerion “blended” its 2014 patient data with ongoing data from patients acquired in 2013 and claimed a “cumulative” drop-out rate of 36%. Using basic algebra, one can deduce the reason why different cohorts and time periods were “blended” together: isolating patients acquired in 2013 and following them from the onset to the first 9 months of 2014, we calculate a relevant drop-out rate between 50% and 60%. Aegerion had previously led investors to expect the drop-out rate to be 15%. Being ill-prepared for even the 36% blended rate, investors sold off their shares. The stock dropped over 40% on the day following the announcement. Obviously investors regarded this news as material. And given the facts presented in this report, it is clear that Aegerion has omitted material facts in previous reporting periods and is continuing to do so now. Cumulative dropout rates have been accelerating as time passes. Thus, it is probable that, contrary to Aegerion’s claims, dropouts within a single cohort increase over time as adverse events accumulate. We follow this logic in the reconstruction of what may be happening with Aegerion’s 2014 dropouts. If the first year experience in 2013 was 15%, we use this rate to estimate the new patients in their first nine months in 2014. With these estimates we try to fill in the blanks: What is happening with the second year on the drug? What can we say about the 2013 cohort over 21 months? Because dropouts are obviously accelerating and because the numbers for 2014 represent a shorter time period, at first glance it is tempting to use a percentage smaller than 15% to estimate dropouts for the 2014 cohort. However, a second glance suggests that 15% might be the better number after all. 15% is made up of an extremely small sample of two elements. Dropouts for the first six months of 2013 was said to be 10%. The cumulative rate for all of 2013 was said to be 15%. This means that dropouts for the second half of 2013 must have been around 20%. (10%+20%)/2 = 15%. In 2014 we are only working with 9 months, so it would seem reasonable to work with a number between 10% and 20%, given that dropout appears to be accelerating as time passes. Note however that if we do lower the dropout rate below 15% (green cell in the puzzle), then the dropout for patients acquired in 2013 and tracked in 2014 (Cell C) increases in proportion. 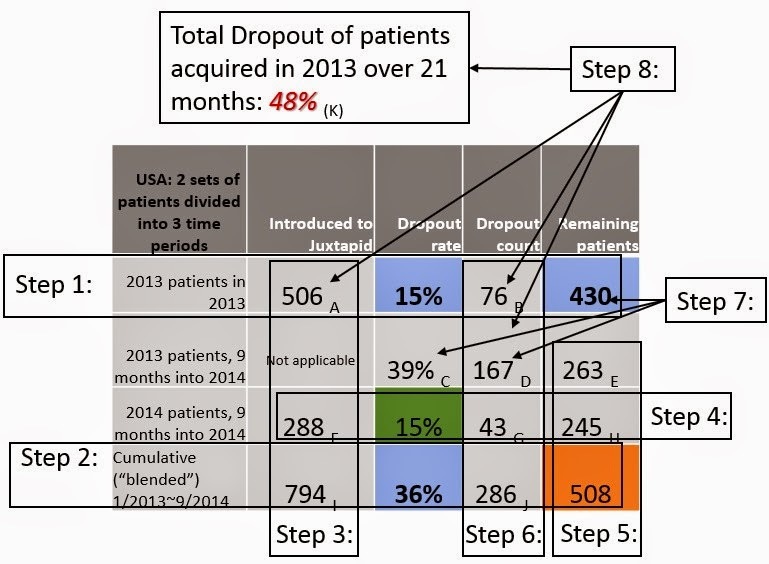 For example, a 10% cumulative dropout for patients acquired in 2014 calculates a 42% dropout in 2014 for those patients who were acquired in 2013, while 15% calculates 39%. 15% here puts Aegerion in the better light when we get to the final tally for the 2013 cohort. On the other hand, if this dropout rate is higher than 15%, then either Aegerion’s 2013 disclosures are suspect or Aegerion has not fully disclosed new factors in 2014 dropouts.